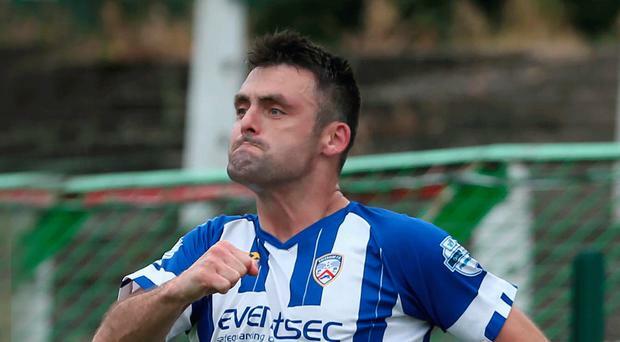 Rodney McAree wants his Coleraine side to keep their discipline and 11 players on the pitch today to give them the best chance possible to win the derby at home to Ballymena United. In each of the previous two league games between the sides this season the Bannsiders have had a man sent off. In September there was an eventful 2-2 draw at Coleraine Showgrounds when Eoin Bradley was dismissed early on and that was followed in December by a red card for James McLaughlin during a dramatic 3-3 draw at Ballymena. The Boxing Day clash saw David Jeffrey's men mount a brilliant comeback from 3-1 down with Coleraine fans left thinking had it been 11 v 11 they would have held on for a pleasing victory. McAree may have only took charge at Coleraine earlier in the season but he says he already knows the importance of this clash to the respective clubs and supporters. "We want to play well, get a result and make sure we don't let our supporters down because I know how much this game means to them. It hasn't taken me too long to understand the rivalry between the two teams," McAree (above) said. "It would help our cause if we keep all 11 of our players on the pitch which hasn't been the case in the last two derbies. "In the first one we didn't give ourselves a chance of winning it because we had a sending off after something like 12 minutes so we played most of that match with 10 men when Eoin Bradley got shown a red card. "In that game we ended up doing extremely well because we came out with a draw. "Away to Ballymena on Boxing Day we were going well in the game and then unfortunately James McLaughlin picked up a second yellow card and was off, so the two times we've played in the derby this season we've ended up a man short. "I'd like to think we will have 11 at the finish this time and that will give us more of an opportunity to win it." Last season it was Coleraine going for the title with Crusaders. This time around Ballymena have put up the strongest challenge to league leaders Linfield even if the gap has widened in recent weeks. "I think Ballymena are still in the title race and knowing big Davy he will be looking to win every game and see what happens. It's a big match for us and it's a big match for them because they want to stay as close to Linfield as possible," McAree said. The teams will enter today's clash at Coleraine on the back of contrasting results. The Bannsiders came from behind twice to overcome Larne 5-3 in a thrilling Irish Cup quarter-final while Ballymena were battered 3-0 at Crusaders in the same competition. "For us I think it comes at a good time after our great victory in the Irish Cup," added McAree. "If it hadn't been Ballymena and had been a lower placed team, without being disrespectful, a little bit of complacency may have set in but that won't happen with this game." Ballymena are in the middle of their toughest spell of the season. In the last month they have lost to Linfield in the League Cup final and in a vital league encounter at Windsor Park, and last weekend were knocked out of the Irish Cup at the quarter-final stage. They aren't out of the title race but runners-up spot seems more realistic which in itself would show how far David Jeffrey and his team have come. Jeffrey is targeting a strong run until the end of the campaign though he wasn't helped on Thursday night when top scorer Cathair Friel sustained a broken collar bone after a freak training ground accident. Friel has been superb this term for the Sky Blues with 13 league goals to his name and is set to miss the rest of the campaign. It's a big loss for Ballymena. By Conor McLaughlin Rodney McAree cut a more upbeat figure than might usually be expected from a manager who had just watched his side slip to a third straight defeat. By Alex Mills Eoin Bradley insists his wounded Coleraine team can't afford to dwell on the disappointment of last weekend's Irish Cup semi-final defeat to Crusaders. By Alex Mills in the Sunday Life Fuming Rodney McAree took a swipe at referee Tim Marshall after his team’s Tennent’s Irish Cup semi-final defeat to Crusaders at The Oval.